Cleansing and protection is a vital component to our work as magicians and root workers. Even for non magickal folk, regular “clearing out the cob webs” is important to maintaining a healthy lifestyle. Regular check ups to the doctor or physician is important & so is regular up keep of our spiritual bodies, and cleansing the home, decluttering spaces, helps declutter them mind and spirit. Of course, this might be my OCD I inherited from my grandma… But, there are many products available for different purposes. Some of the products available are Fiery Wall of Protection, Uncrossing, House Blessing, Baby Blessing, Cut and Clear, Devil’s Shoestring, Fear Not Walk Over Evil, Evil Eye Protection, Spiritual Cleansing, and Stop Gossip. Fiery Wall of Protection can be used in conjunction with St. Michael the Archangel. Cut and Clear is a good choice to cleaning out left over energies after a break up. Use Stop Gossip to shut the mouths of those foes who talk bad about you behind your back. Take regular Spiritual Cleansing baths when you work with the public or your job requires physical contact with clients and clean your space and home after working with people. Most of all, prayers to God and the spirits help keep your spirit clean and protected. These are just a few suggestions on how you can use these formulas. Magickal work is creative, spontaneous, alive, constantly evolving. It’s endless and limitless. Protection work is one of the most common requested products that I receive. Love magick is second to this… While most of us think that we only need protection when we are performing a spell against an enemy or we have a jealous coworker at our job, little do people realize that we need to always keep our self protected from the little negative influences that rub off on us from doing the daily activities of the daily grind. How many people do you come in contact with while working customer service or simply going to the grocery store? Now it might seem silly and ridiculous but you have some people who are naturally a magnet to absorbing energies of other people! You might have the gift of being a healer. Healers can take off negative energies via a variety of techniques such as smoking a client, using an egg to absorb it, or even by using meditative touch or reiki. Once the energy vibe has been removed it must be released or transformed. Healers have the knowledge and understanding of how to remove this energy effectively while maintaining their own balance and cleansed spirit. Unfortunately, not everyone knows how to balance their energies or protect themselves though. When needing protection, this doesn’t necessarily mean that someone is working evil spells against you. I have learned that there are plenty of people in the world who are envious and harbor a hint of jealously to others and therefore those energies alone can be disruptive in one’s own life. We call this the “Evil Eye”. You might have a friend who is your best friend in the world, but that friend might have a secret jealous streak that she might even think is harmless. I have had clients come to me over their very own sisters being jealous of their family and children. Then there are times when you have a destructive person deliberately trying to sabotage your relationship, make you ill, or jinx up your money. So, as you can see, there are numerous ways to protect, uncross a jinx, cleanse the spirit, house, business, etc. Here are some samples of easy spells to remedy some common issues. Set up your image of St. Michael, sprinkle holy water on the image. Holy Water clears the previous and old energies left on the images. 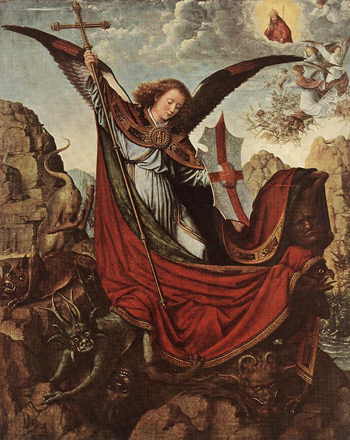 Next, anoint St. Michael with protection oil. Say, in the name of the father, the son, and the holy ghost. Amen. Or a blessing of your choice. Dress the candle with the protection oil and light the candle. 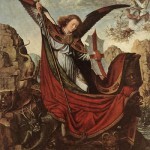 Recite the prayer to St. Michael. Recite Psalm 91 or another protection prayer of your choice. State your personal petition to St. Michael. Repeat the lighting of the candle, incense and prayers for 9 consecutive days. Sprinkle the body with holy water or blessed water. Obtain a evil eye protection charm such as the hamsa hand charm (eye in the palm of a hand), or a blue eye charm (very popular on the internet for very cheap!) I also sell evil eye protection oil and bracelets. If you obtain an evil eye charm, you can simply carry this in your wallet or purse or make a necklace out of it. Take an egg and roll over the face of the victim (the egg absorbs the energies). Take the egg to a tree and throw it at the base of the tree, breaking it. The tree will absorb the energies to be transformed. Recite Psalms 11 and 101. In the early AM before sunrise, run a hot bath and pour bath contents in. Step in tub and wash downwards praying the 37th psalm. Step out and air dry. Light the black candle for uncrossing that has been dressed with the oil. Take a cup or bowl of the used bath water and after getting dressed in clean clothes, take outside and throw it to the rising sun in the east OR take it to a crossroads and throw it over your left shoulder to the rising sun in the east. Walk home not looking back. Once you are ready for your day, now would be a great day to keep your head covered. Make little physical contact today with people. You can repeat this spell (pinching out the candle each day but letting it burn all the way out on the last day it is performed) for 9 or 13 days. If you are using a figure candle divide the candle in so many days that you are performing the ritual. Also, divide your bath contents so you have plenty each day as well. If you want to use a regular black Vigil candle, you can obtain a large black one that will burn about 9 days straight without extinguishing it. Time it accordingly. OR you can obtain 9 stick candles like chime candles which are sold on the internet in packs of 20. Look for party or chime candles, they are 4 inches tall. They burn about 1.5 – 2 hours. Use one a day. 🙂 If you are using a double action candle do the spell for one day only. Cut off the wick and flip the candle over, carve the tip to expose the wick to light so you burn the black portion first. Let it burn all the way out that one day. Bathe in the same formulas as used on the candle and pour the water over your head 13 times, pray for protection. Air dry and dress and take a saved cup of the wash water and throw in the east to the rising sun earlier morning. Carve your name in a white or purple figure candle. Oil it with fiery wall of protection, stop gossip, law keep away and victory oil. Add a strand of your hair to the candle. Set on a plate in the center, Sprinkle in a circle about 6 inches out from the candle, slippery elm, alum, and red hot Tabasco sauce. In a circle inside of this one, 3 inches out from the candle, lay a circle of devil’s shoestring, crossing the sticks to close in your circle. Light the candle and recite beginning with Psalm 7, 14, 20, 31, 35 through 39, 52, 53, 94, 120 while the candle is burning. This is 13 total psalms. Allow the candle to burn completely out. Take the remains of this and tie it up in a white cloth and bury it in the back yard.